Fiege Logistics Switzerland, an IFLN member representing seven countries in the Network, successfully handled a historic project involving the full charters of an Antonov 225 (AN-225) and a Boeing 747 (B747-400F). 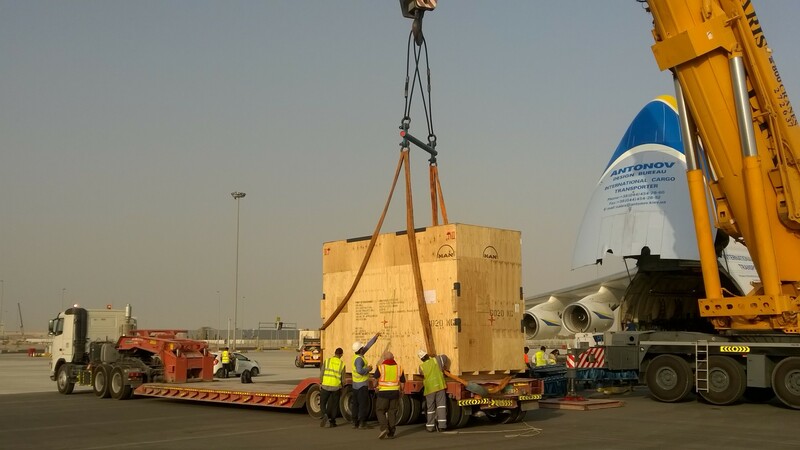 The delivery of the oversized oil and gas equipment marked the first time an AN-225 had landed in Abu Dhabi, U.A.E. 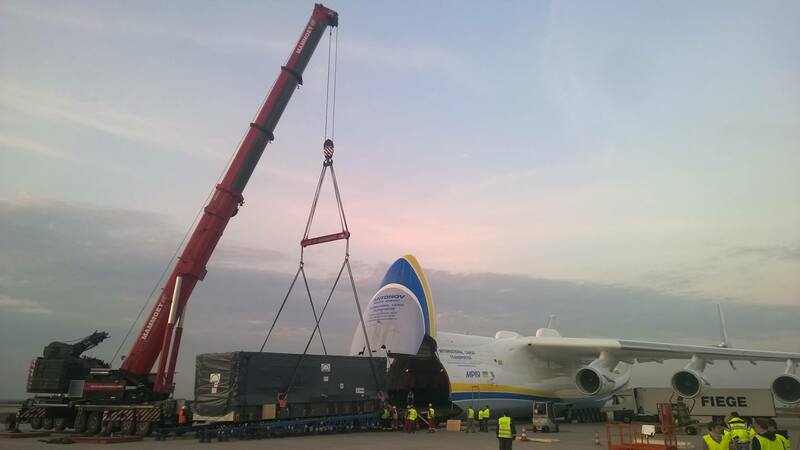 The largest of the six pieces being loaded onto the Antonov 225 in Germany. The time critical shipment totaled more than 230 tons, and as the cargo was located at two different airports in Germany, Fiege’s specialist team devised using both the AN-225 and B747-400F. To capture the momentous occasion, a television crew from BBC also boarded the world’s largest cargo plane en route to Abu Dhabi. Closely monitoring all operations at the Leipzig Halle Airport, project manager for Fiege Switzerland, Oliver Hoz, oversaw the loading of the AN-225. The 84-meter long plane began loading at 2 p.m. Thursday, May 19, and concluded the next morning at 6 a.m. With such a mammoth plane, weighing 285 tons just by itself without cargo or fuel, Fiege team member Lukas Ramseyer also assisted in managing the 16-hour process. In addition to the AN-225’s internal winch and ramp loading apparatus, an external crane was also required to maneuver and load the six heavy lift pieces. A compressor, which was the largest of the six pieces, weighed in at 79 tons and measured more than 14 meters long. for transport to the final destination in Abu Dhabi. After more than 150 tons of cargo was successfully loaded, the AN-225 was dispatched on schedule for Abu Dhabi, stopping for refueling in Cairo, Egypt. Needing to closely synchronize their operations, Marc Hoffman of Fiege Fritsch Forwarding (Germany), supervised the loading of the B747-400F at the Frankfurt-Hanh Airport. The second consignment of almost 80 tons was loaded without delay and departed on schedule. The cargo’s final delivery 60 kilometers outside of Abu Dhabi was completed on flatbed trailers May 23. This accomplishment would not have been possible if not for the planning and preparation by Fiege. Through their numerous meetings, site visits and cargo assessments, their customer’s cargo was successfully delivered.